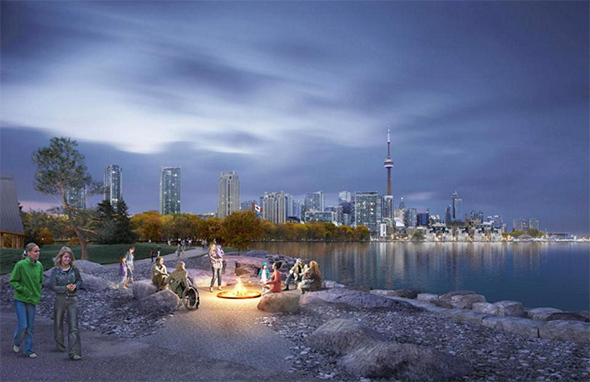 Toronto's waterfront has come a long way since its days as an industrial hub. Last year's revitalization of Queens Quay was a major step forward in making the harbour more inviting, but that was just the tip of the iceberg when it comes to the changes in store for this part of the city. There are numerous corridors throughout Toronto that are in the midst of massive change. Two that immediately come to mind are Yonge and Church streets, which are duelling for the title of most likely to be unrecognizable in a decade, but you would have to add the waterfront to this list. 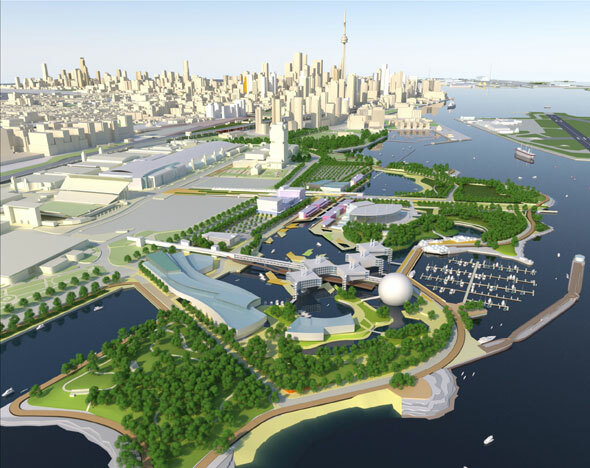 To the same degree that the Queens Quay revitalization opened up the central portion of Toronto's lakefront, the re-imagining of Ontario Place will prove a major draw to the west. 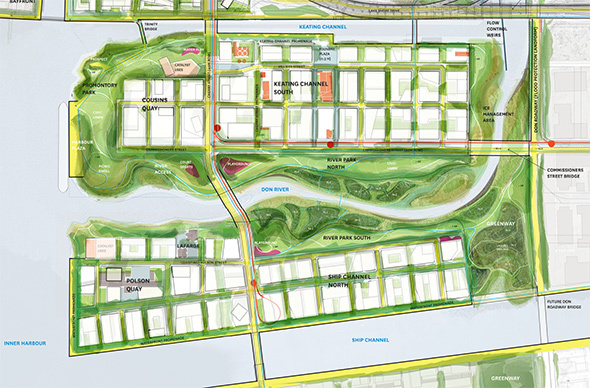 The massive project will be developed in stages, but the first part - a 7.5 acre park - is scheduled to open this fall. Some of the highlights from the first phase of the project include a waterfront trail, an open air pavilion, and a fire pit. The idea is to make the place all about the lake, something that Ontario Place didn't entirely do given its strong focus on attraction-based entertainment. 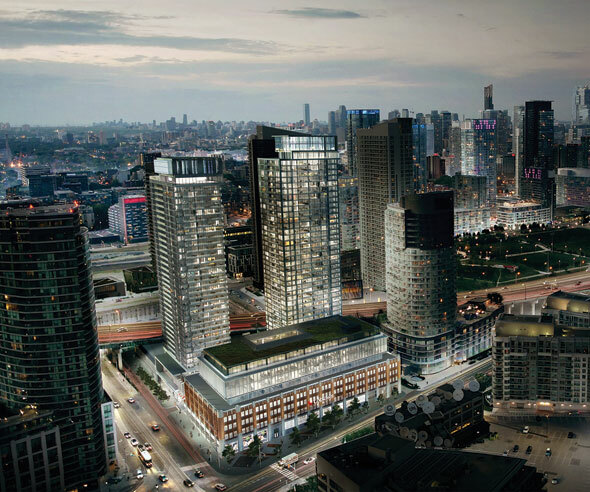 Moving to the east, Loblaws redevelopment of its warehouse at Bathurst and Lake Shore could have a significant impact on this stretch the street, which has filled with condos over the last decade, but remains short on amenities. The residential element of this project is obviously huge - over 850 units are planned - but it's the retail that should prove a boon for the area. The section of Queens Quay between Bathurst and Rees. St. is quite well established at this point. While some existing parking lots could become sites for future development, it would not be on the scale of other projects currently in the works throughout the lakefront corridor. 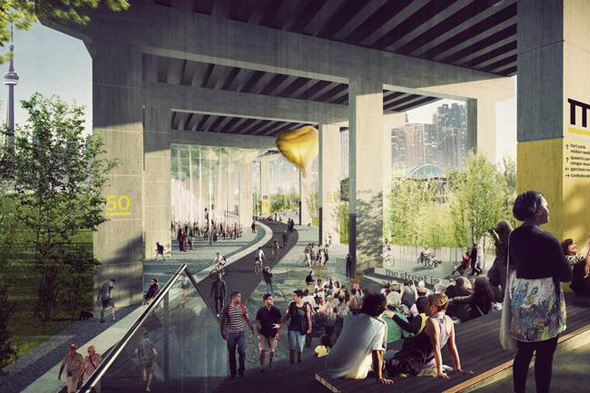 That said, the Under the Gardiner urban park will completely revitalize the neglected space just north of the street. 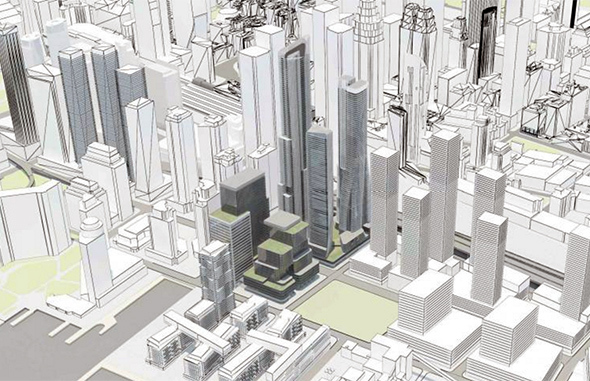 Toronto's skyline will have a new notch in later this year when 10 York St. is complete. It's not quite on the waterfront, but is in fact wedged between the Gardiner Expressway and one of its off-ramps. The triangular podium already looks fascinating, and at 65 storeys it'll help to push South Core even closer to the water. 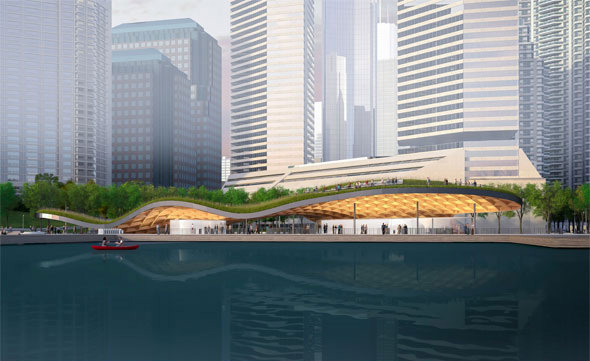 Just a short walk to the east is the Jack Layton Ferry Terminal, which is also due for a massive redevelopment that promises to make the now jail-like structure a major showpiece right on the lake. Not only will the terminal itself be a significant architectural addition to the city, but the adjacent grounds should finally live up to the potential of the location at the heart of the waterfront. The section of Queens Quay that's due for the most profound change, however, is just to the east. The entire stretch of the street from Yonge to Parliament will be transformed in the next decade. 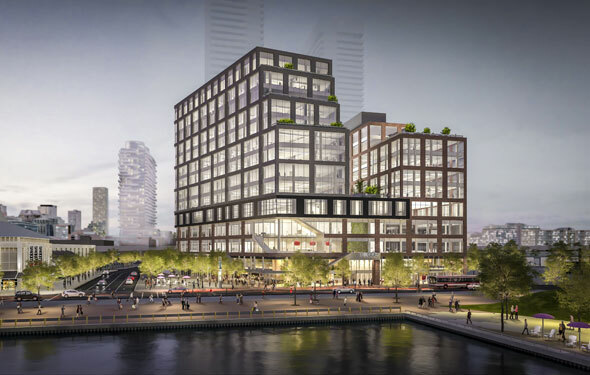 Some of this process has already started with places like Sugar Beach, the Corus Building, George Brown's waterfront campus and the Pier 27 condos, but way more is still to come. 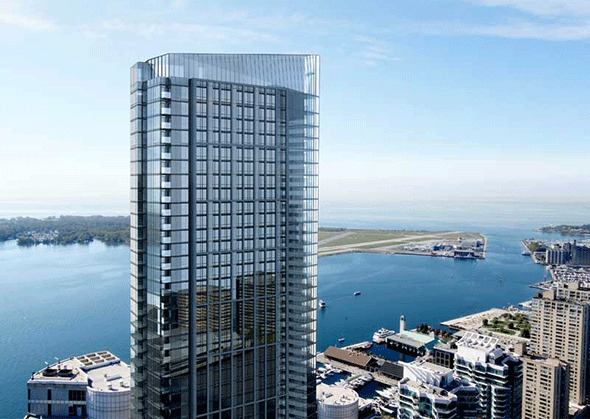 Many of the developments in store for the eastern waterfront could be characterized as large-scale, but none so much as 1-7 Yonge St., which could include the tallest building in the country, plus four others of significant stature - one of which would be a revamp of the eyesore that is the Toronto Star Building. Just a stone's throw away you have the Daniels Waterfront "city of arts" mixed use development on the former site of the Guvernment/Kool Haus. It's due to be completed in 2018 and will feature 60,400 square metres of residential space, 26,000 sq. m. of office space, and 25,000 sq. m. of retail. 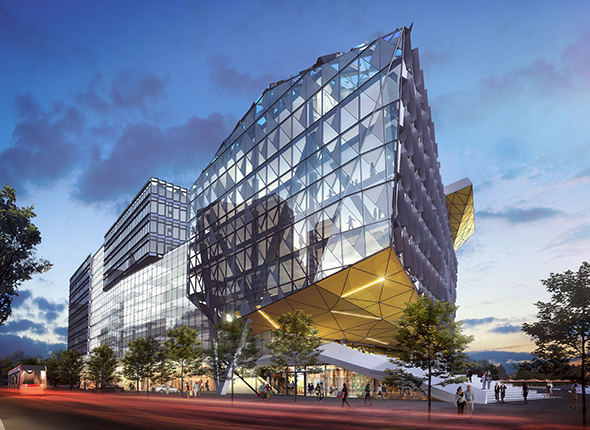 Across the street, the Waterfront Innovation Centre will join the cluster of buildings around Sugar Beach. There's no residential element to this building, which should auger well for a future neighbourhood planners would like to see avoid having a disproportionate amount of residential space to other uses. On the south side of Queens Quay immediately to the east are the side-by-side projects of Aqualina and Aquavista Bayside, both of which will extend the waterfront promenade to the east while adding more restaurants and retail to the lakeside. These condos are better designed than the towers that first grew on the west side of street 20+ years ago, which tended to block access the lake. And, just in case you thought that Toronto would keep up its record of bland glass condo towers along the waterfront, you have Moshe Safdie's Monde condo project just to the north of these two sister developments that looks about as elegant as residential building come in this city. It's due for completion in the summer of 2018. Beyond East Bayfront, the picture is a bit less clear. 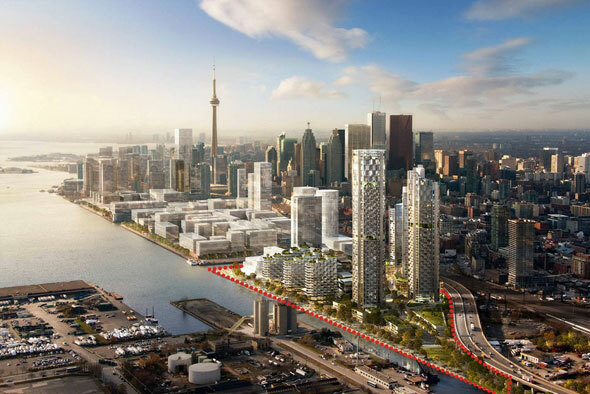 There are major plans for the area in the form of the 3C waterfront development, which promises a huge mixed use addition near the foot of Parliament St. designed by Foster + Partners (who are also behind The One), but the city's initial plans for the eastern Gardiner put a hold on the project. With a new configuration favoured by city staff, you can expect to hear more about 3C in the near future. 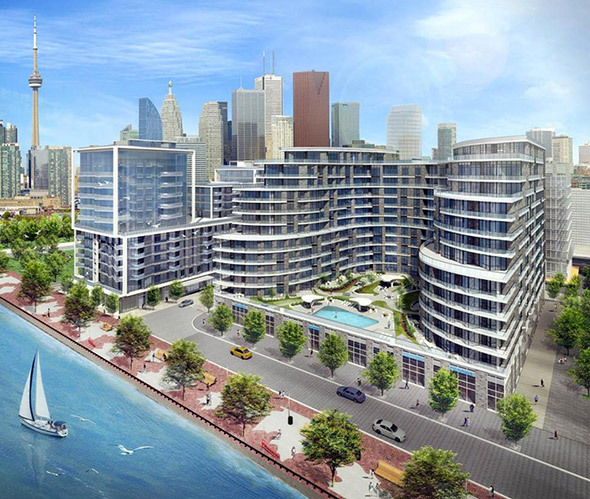 Once the Gardiner picture has come into focus, that'll pave the way for even more development in the West Don Lands, including the re-naturalization of the mouth of the Don River. That'll take more than a decade, but there's no sign that changes to Toronto's waterfront will slow down.